When DeShaun Watson threw a touchdown pass to walk-on wide receiver Hunter Renfrow with one second remaining on the clock, it sealed the national championship for Clemson and put the cap on an incredible season. It also made Dabo Swinney a huge amount of money. The Clemson coach maxed out one of the largest performance incentive packages among all of college football, taking home $1.4 million on top of his base salary. Let's take a look at how Swinney was able to rack up the incentives. First, he received $150,000 for getting Clemson to the 11-win mark, which the Tigers did in blowout fashion, dominating their in-state rival South Carolina to the tune of a 56-7 victory. When Clemson knocked off Virginia Tech in the ACC Championship game, that was another $150,000. 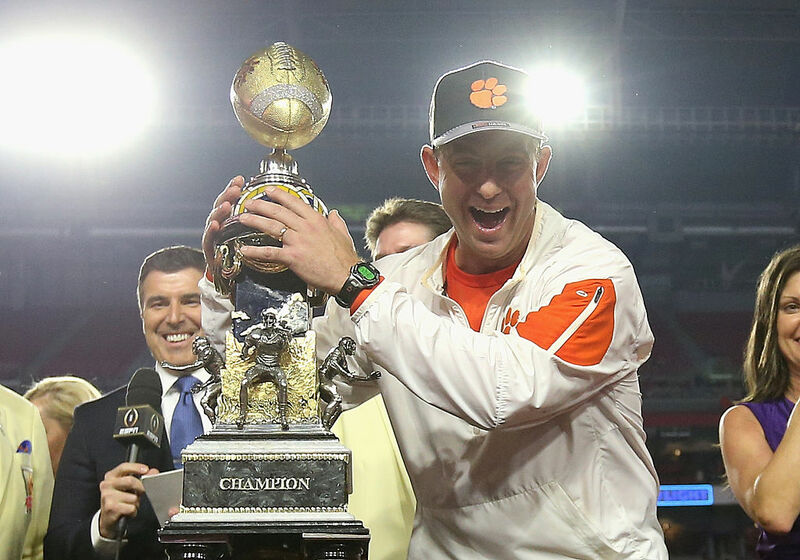 Once Clemson was named to the College Football Playoff, Swinney received $400,000. He crossed the million-dollar mark in Clemson's 31-0 demolition of the Ohio State Buckeyes, which earned him another $400,000. Thanks to that victory, Swinney essentially picked up another $200,000. He had a stipulation in his contract that if the Tigers finished in the Top 5 of either the USA Today Sports Amway coaches poll or the Associated Press poll, he'd received a bonus. Even if the had Tigers lost the championship, it's hard to imagine Clemson would have dropped four spots. Then, with the championship secured, Swinney picked up his final $100,000 bonus. As a comparison, Alabama coach Nick Saban earned another $425,000 for returning to the title game. Schools have started using incentives more frequently when offering contracts. It's a savvy move on their part, as it sounds like big money for a coach – but only if he achieves the school's goals. Because success can be unpredictable, Clemson took out an insurance policy to cover those expenses. It may end up saving the athletic department more than $1.2 million this year. Swinney signed a six-year contract extension in April that raised his pay to $4.42 million this season, a nearly 34 percent increase. He's the 12th highest-paid coach in college football. Saban and his $6.9 million base salary are ranked second. This year, though, Swinney and his Tigers got the last laugh. When Dabo Swinney became Clemson's interim head coach in 2008, he was a little-known wide receivers coach. Fast forward to 2016, and he has become the second-highest-paid head coach in the ACC.